In Canada it is progressive when a city incorporates composting. There is still a large debate on the economics of recycling beyond the most basic in a resource rich country. In Japan, they take garbage sorting and distribution very seriously, as you would expect as the country is land and resource constrained. But for a newcomer, the garbage system can be quite daunting. We had to cut this out and put “cheat sheets” on each of the 4 different bins that we have in the apartment. And to be clear, make a mistake and you could face a fine. This is serious stuff and required many re-reads before we got it right (smile). At least it is in English. Candidly, I admire them and am glad to do my part. Canada should do a lot more of this. 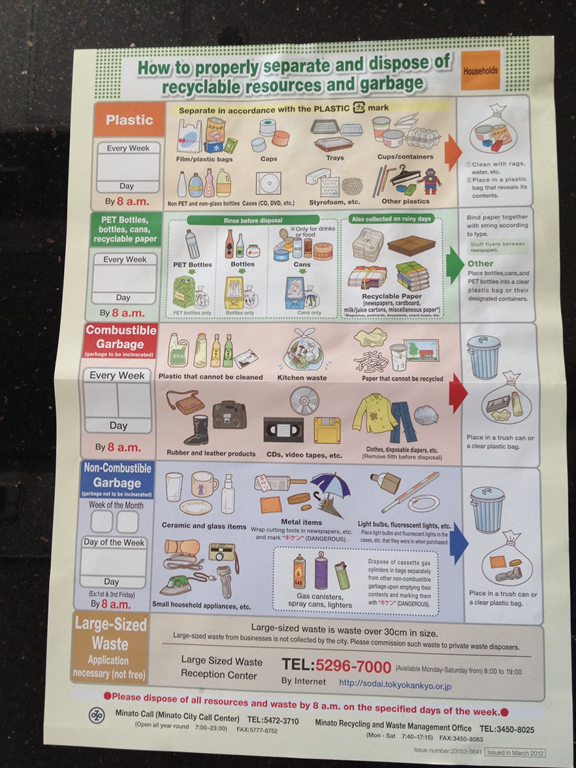 This entry was posted in Our Asia Adventure and tagged Expat, garbage, Japan, recycling, Tokyo by michaelweening. Bookmark the permalink.